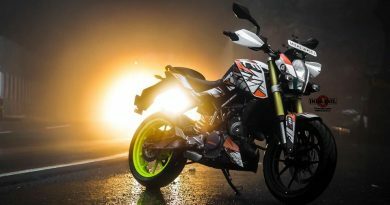 I came to know about Road Thrill through Facebook, but initially couldn’t attend any of their rides even though I received many ride invites into my mailbox. My first ever event with Road Thrill was the Blood Donation Camp, which was conducted in May’2016. Arun Bhai provided me with full event details and guided me to the Blood Donation venue. My 1st ride with Road Thrill was World Motorcycle Day’2016. 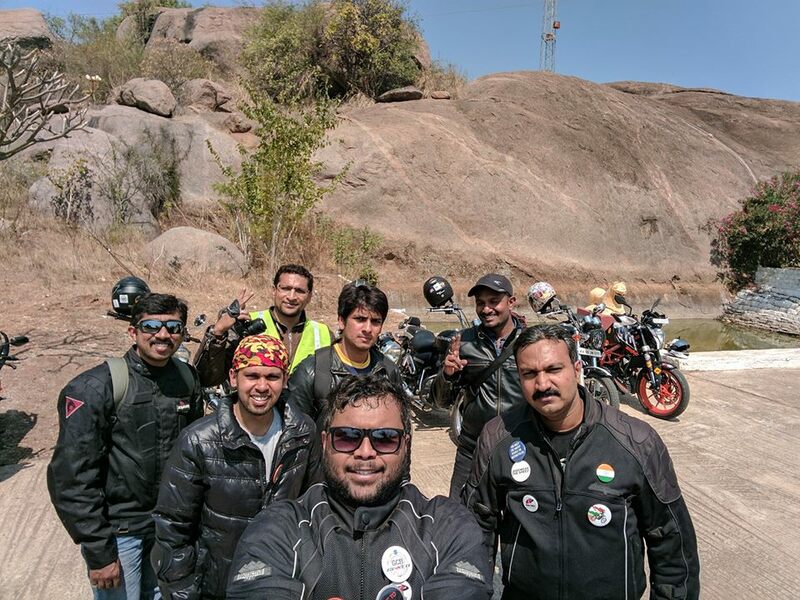 The ride was to Penukonda Fort in Andhra Pradesh. Many rides were being scheduled in Bangalore on account of World Motorcycle Day. But what attracted me to Road Thrill’s event ? The main reason being the place Penukonda Fort. I always loved to explore different places and had never been to Penukonda before, so I decided to join them. Vijayanth Bhai briefed about the group riding etiquettes that was being followed. It was a ride where everyone strictly followed all the instructions and in proper riding formation and with proper ride signals. 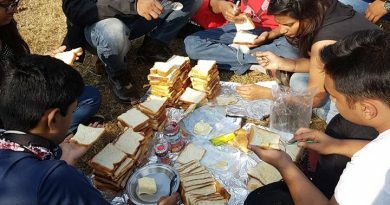 KC bhai’s marshalling was just amazing. We got to know about the fellow riders over the brief introduction session we had at the lake side. Nobody overtook the lead nor did anybody lag behind the tail. 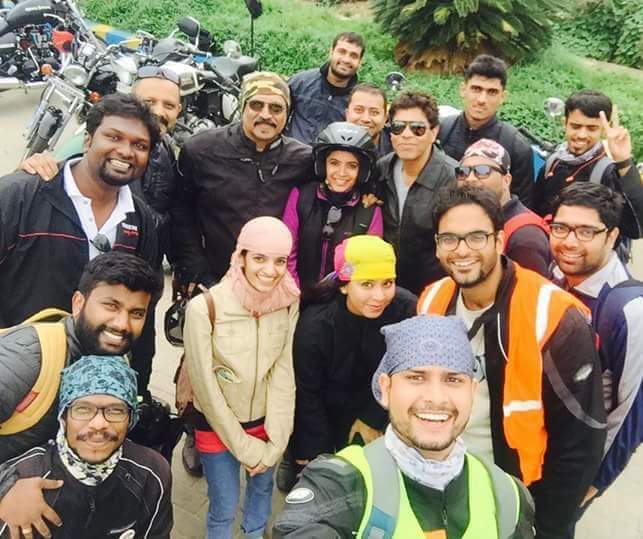 That was a well-organized ride to Penukonda. 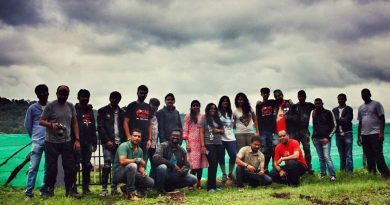 The next was the Dinner ride to Rangrez Restaurant at Ram Nagar on the Bangalore – Mysore Highway. A video where a group of bikers danced while meeting their fellow bikers made rolls on Social Media. Post a delicious dinner; we did the Harlem shake, where all the bikers enjoyed dancing with fellow bikers. 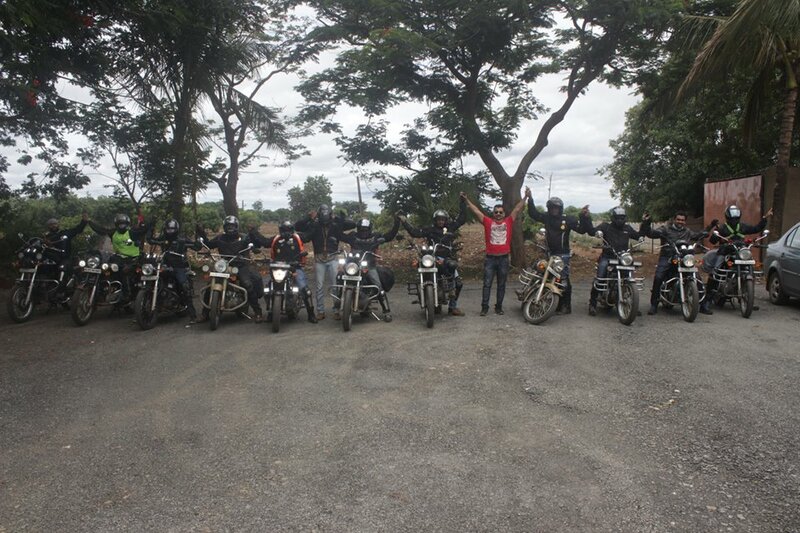 We had Usman Bhai who rode all the way long from Dharmapuri to Bangalore only to join Road Thrill for the dinner ride. Then came the big event: Republic Day Ride’2017 to Lepakshi. The invitation was spread to many other biking groups based in Bangalore and making the count of 200+ bikers riding together to celebrate the joy of Democracy. Bikers came with the Tricolors flying high on their bikes. I always wanted to ride with the Tricolor on my bike which happened in this ride. It’s never easy to manage 200 bikes on road riding together to a destination, but the marshals managed very swiftly. Post Republic Day Ride, we had a breakfast meet up which was followed by a ride to Thimmappana Swami Betta. Not everybody can make to every ride due to some other personal commitments. This is why we have regular Breakfast meetups in the city limits where we get to know the new members, planning of the next upcoming rides, sharing of individual travel memoirs, badge distribution and lots more. It’s not just a breakfast meet; it’s a meet where members build friendly network within RT Family. It was back in Feb, when I met JP bhai during Leh Ladakh planning. That’s when he asked me Are you into blogging? Try Blogging, it’s Fun ! ! And, the same time one of my cousin said you keep travelling to so many places, you should share your travel stories, not everyone can just hit the roads and explore as you do, your travel articles should share all relevant information to your readers. 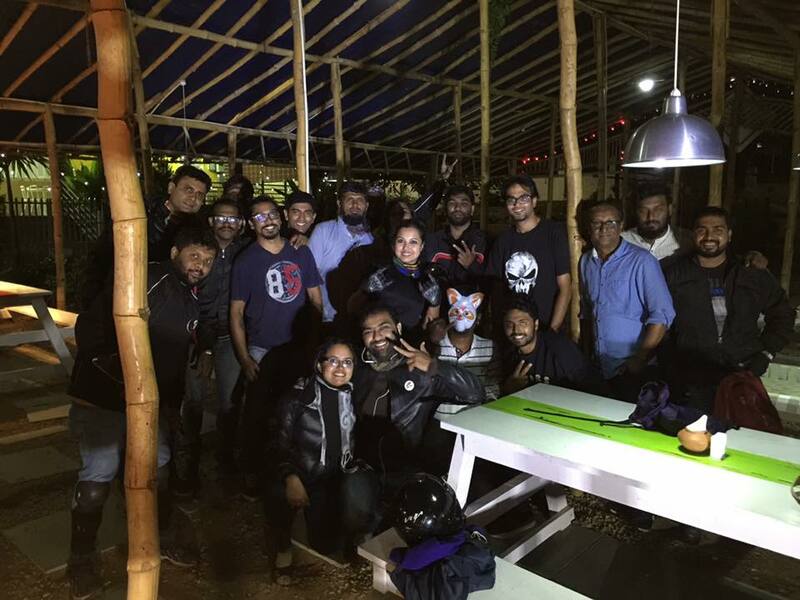 Soon came the Dinner ride to truckers Dhaba near Tumkur in March’17 where 50 bikes made for the trip. Yes the number was actually 50. 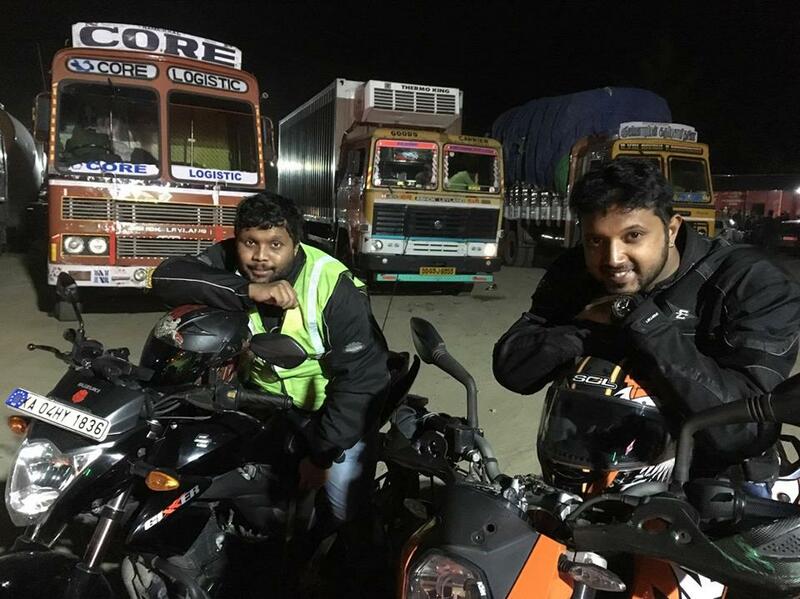 My friend Shreyas joined the ride too. Shrey and I used to discuss about bikes back those days in school and used to ride together during college days and we rode together after a long span of time. Thank you team Road Thrill for cherishing my old memories. After I was back from my Ride of 3 States in mid of April, and then I was named as #RTPathfinder. Thank you JP Bhai for the name credits. My very first 2 day ride with Road Thrill was the ride to Dandeli. 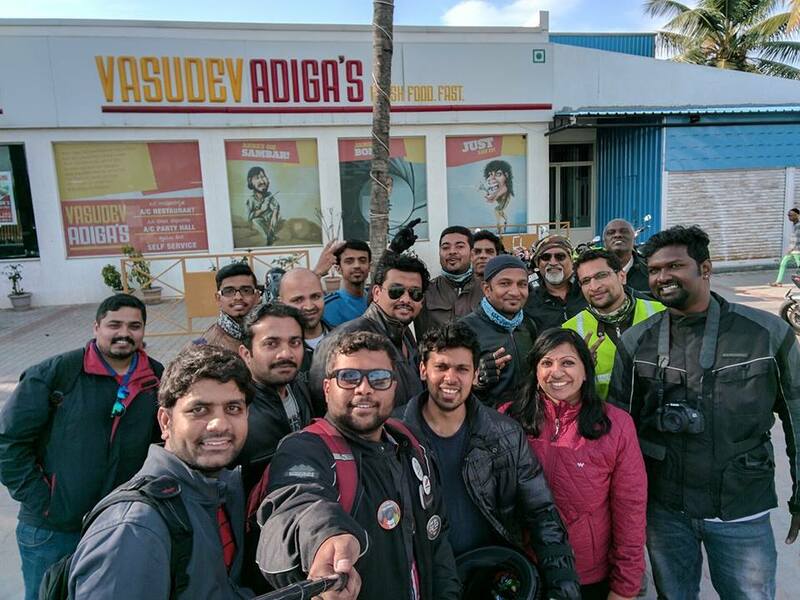 It was meet up ride for RT Bengaluru and RT Pune. As stated earlier all Road Thrill events are named creatively, this time it was #RTCrossroads. I was excited to ride to Dandeli, as the place being my birth place. It was yet another memorable ride where not only bikers, we had 2 pets that came along with us and me being a pet lover, I was overjoyed. We had a good time spent at the jungle resort which was followed by Kayaking in the River Kali. The dinner alongside the Bon Fire and listening to the music played by Soloman Bhai on his guitar was just amazing. The best part of Road Thrill members is the togetherness and the unity everyone shows to fellow members. If we have enjoyed together as a group, it’s everyone’s responsibility to support the fellow members while in problem. While coming back from Dandeli, when Gaurav Bhai’s car was been hit from behind by an overloaded cab, we stood alongside the highway amidst the rains until it was wrapped up. The next following day was a Monday, everybody had their offices and other professional commitments, but nobody left the group behind. The spirit of Biking Brotherhood is always held high. Then came my DreamRide to Leh – Ladakh. Though I personally could not make it to Leh, and my team went ahead with the journey. 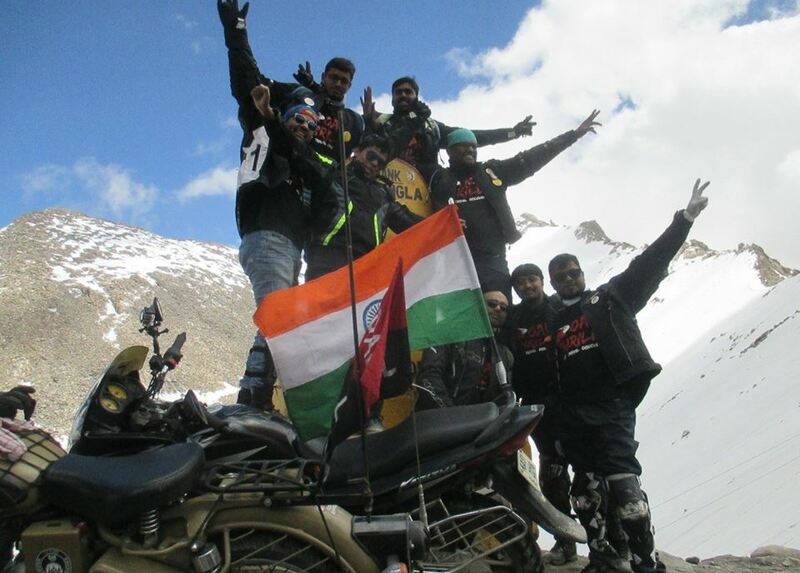 A proud moment when my team sent me the pic from KhardungLa – The World’s Highest Motorable Road. I was happy to see my team reaching the highest peak with the Tricolor and Road Thrill Flag. Many thanks to Harsh Bhai and Varun Bhai from our Delhi and Hyderabad chapters for all the help in Delhi on my way back from my Leh Journey. It was for the Independence Day Ride – 2017 where the ride was in the fond memory of Surbhit Kant Dixit who passed away in a road accident during his 50th Ladakh Circuit. All of our chapters were riding with the same cause. May Surbhit Bhai’s Soul Rest In Peace. We (Anirban Bhai, Lohit Bhai and I) tried hard to brave the floods, but our bikes didn’t support. Our bikes were hydro-locked. We parked our bikes at Lohit Bhai’s place and I rushed home. Meanwhile, Anirban Bhai and Lohit Bhai towed my bike to the nearest mechanic. Thank you Anirban bhai and Lohith Bhai. Road Thrill is not only a group; we have all become a family. All the members are from diverse culture and religion, but never we have discussed or argued on the basis of religion, politics, culture, caste. The only things been discussed amongst the members is Bikes and the discussion about the crazy travel stories they have had. When JP bhai during a ride, explained how Road Thrill started. He said it’s not the bike we ride, it’s the passionate biker behind. Though majority of the bikes are the thumping Royal Enfields, I have never seen any member disrespecting a non Royal Enfield biker. Everyone’s opinions are respected. Everyone’s respected as a Biker. No member in Road Thrill family has ever compromised on safety. ATGATT (All The Gears All The Time) is always followed. I have personally seen the family growing; Bangalore was the 1st chapter which was then followed by Pune, Hyderabad, Chennai, Delhi, Coimbatore, Shivamogga and Mumbai being the latest edition. That was a fantastic time with Road Thrill till now. Currently I am member of the #RTCrew and #RTBlogging Team, Thanks a lot to entire #RTfamily for all the support and love. Kindly visit our website for more information. You all are welcome to be a part of Road Thrill family, kindly please sign up on our Facebook Page. Well written Gokool bhai, straight from the heart! Pure passion in words! I remember you coming for your first ride; you came with a big smile on your face and asked us “Is this Road Thrill?” Who would have guessed then that it would be the start of an epic journey! It was good to relive some of the rides mentioned by you. Especially Rangrez where we shared a table and made conversation for the first time. Memories of those early days with Road Thrill still hold a special place in my heart. Over thousands of kilometres and many epic rides with you, I have come to admire and respect you for your energy, your passion for riding and your headstrong spirit of adventure to explore new places, to go the last mile, the last motorable road…and then beyond. And do it all over again the next weekend with an even bigger smile. May you and your Warrior be blessed by the Gods!